Warwickshire director of cricket Dougie Brown says the Bears can improve next summer with the players he already has at his disposal at Edgbaston. The Bears were runners-up in both the Championship and One-Day Cup in 2014 and went one better in the T20 Blast, winning the trophy for the first time. But, in 2015, they lost in the semis, came fifth in the Championship and did not get out of their One-Day Cup group. "I'm not sure we need to bring players in," Brown told BBC WM 95.6. "People would need to be better than what we've got and we have a great youth structure with some really good players coming through. Warwickshire still have one player on an England central contract, Ian Bell, but the 33-year-old Bears vice-captain's retirement from international one-day cricket could free him for a few more appearances in 2016. All-rounder Chris Woakes remains on an England incremental contract, but the club should at least get a full summer's uninterrupted use out of batsman Jonathan Trott, who began the 2015 season late following the disappointing end of his international career in the Caribbean. "It was an indifferent season and a few senior players have been down on where they need to be, but we need to address that and march on. All we know is we cannot start next season like we finished this. "In August, we were second in the Championship, well placed in the One-Day Cup and through to Finals Day in the T20. What followed was a hell of a disappointment. For whatever reason, we've fallen away and then ended up losing three of the last four Championship matches. He added: "The guys feel a bit wounded but they can go and recharge their batteries and collect their thoughts. The inconsistencies we showed in all forms of the game have been disappointing. "All we can do is address what isn't right and we already know we can do that. There needs to be a line drawn in the sand and it's now case of how we move on from here. Things aren't desperate but we need to be absolutely clear where we're going." Warwickshire came fifth in the County Championship - their worst finish in five years. They finished exactly 100 points behind champions Yorkshire, but only 25 points clear of relegated Sussex. No Bears batsman topped 1,000 Championship runs (opener Ian Westwood with 858 runs from 14 matches at 36.67 was the best), while four bowlers earned 40 wickets - Jeetan Patel (58), Rikki Clarke (47), Boyd Rankin (46) and Keith Barker (43). 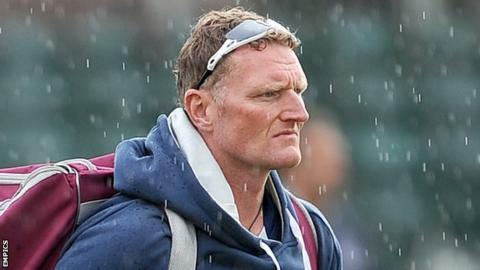 In the weather-hit One-Day Cup, the Bears won only three of their eight Group B games (two of which were rained off), yet only missed out on a place in the quarter-finals on run rate. In the T20 Blast, the holders topped their group to again reach Finals Day at Edgbaston, but slumped to a shock defeat against a David Willey-inspired Northants.